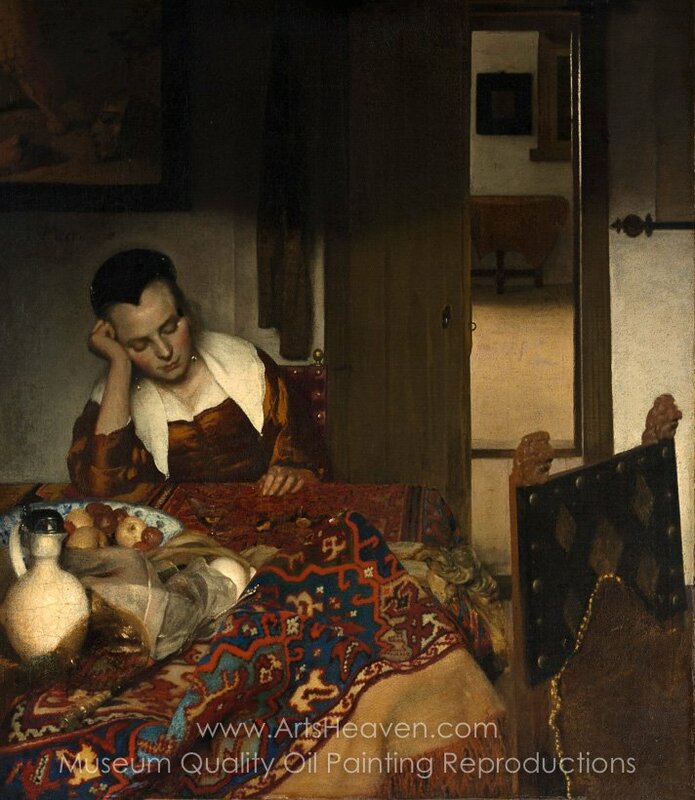 A Maid Asleep, also known as A Woman Asleep at Table, is a painting by the Dutch master Johannes Vermeer, 1657. It is housed in the Metropolitan Museum of Art of New York City. This painting is the earliest indisputable work by Vermeer. The Rembrandtesque influence in this phase of his life can easily be ascertained from the rich and heavily impastoed pigments used in the painting. In the left part of the composition is showed a table covered with a glowing Oriental rug pulled up in front. On it is a Delftware plate with fruit, a white pitcher, and an overturned glass or roemer in the foreground. At the far end of the table is a young woman asleep, her head resting on her propped-up right arm and hand; the left one lies negligently flat. To the right is the back of a chair, and in the distance a half-open door that allows the viewer to see into another room. 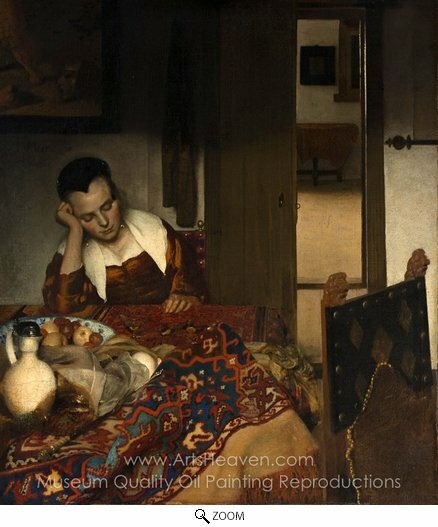 Decorate your home or office with our beautiful museum quality art reproduction of Jan Vermeer A Maid Asleep painting. Why settle for a print, poster, giclee or canvas transfer when you can grace your walls with a genuine oil on canvas painting reproductions for sale at up to 75% below gallery prices. You are commissioning an authentic hand-painted oil painting on quality artists canvas. Painted by professional artists brushstroke-by-brushstroke with attention to all details. Order your Masterpiece today and get Free Shipping to your door direct from our studio.